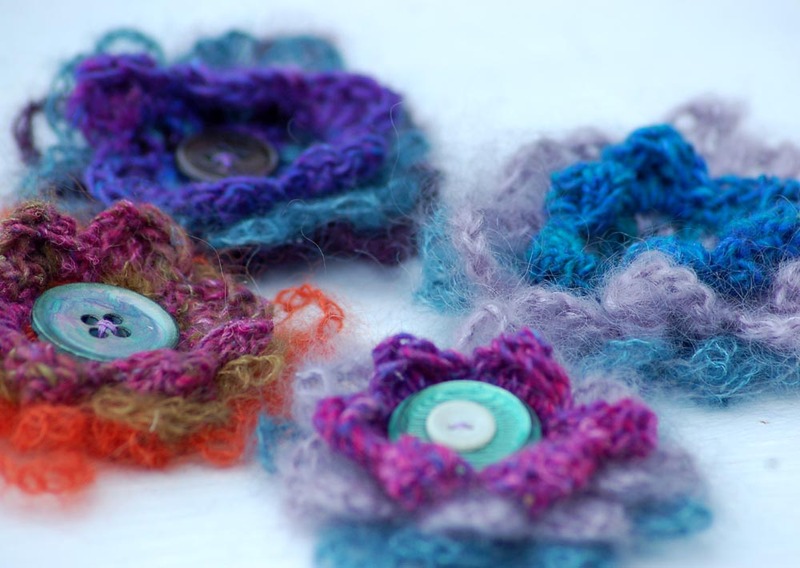 This is a little crochet pattern for these fluffy flower brooches. They are great as brooches or to add as embellishments. I have written this in longhand with abbreviations highlighted to make it easier for beginners to follow. Rowan Kid silk Haze for the outer petals. 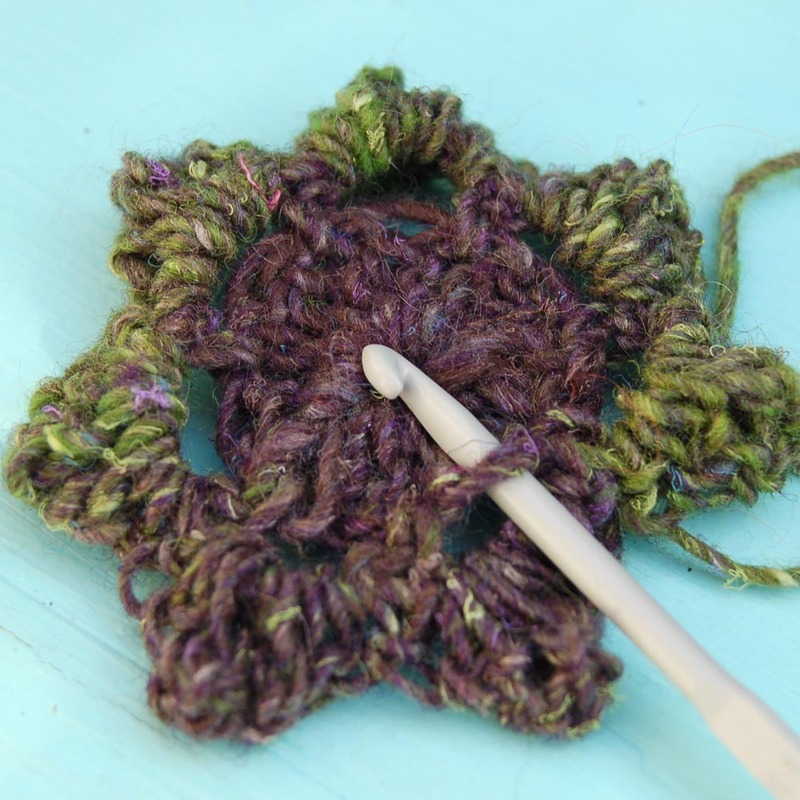 Using the Dk CHain 4, join with a Slip Stitch to the first CHain forming a circle. 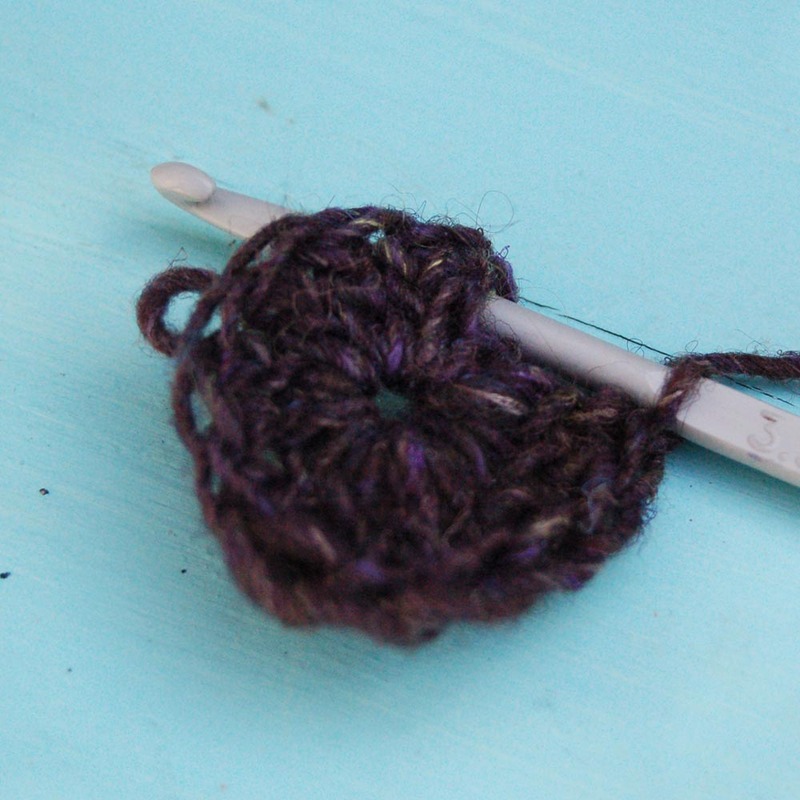 3 CHain then Treble Crochet into the circle (yrh put hook through circle yrh pull back through. (3 stitches on hook) yrh pull through 2 stitches yrh pull through remaining 2 stitches) repeat 13 more times, you can move the stitches along slightly if it gets tight. 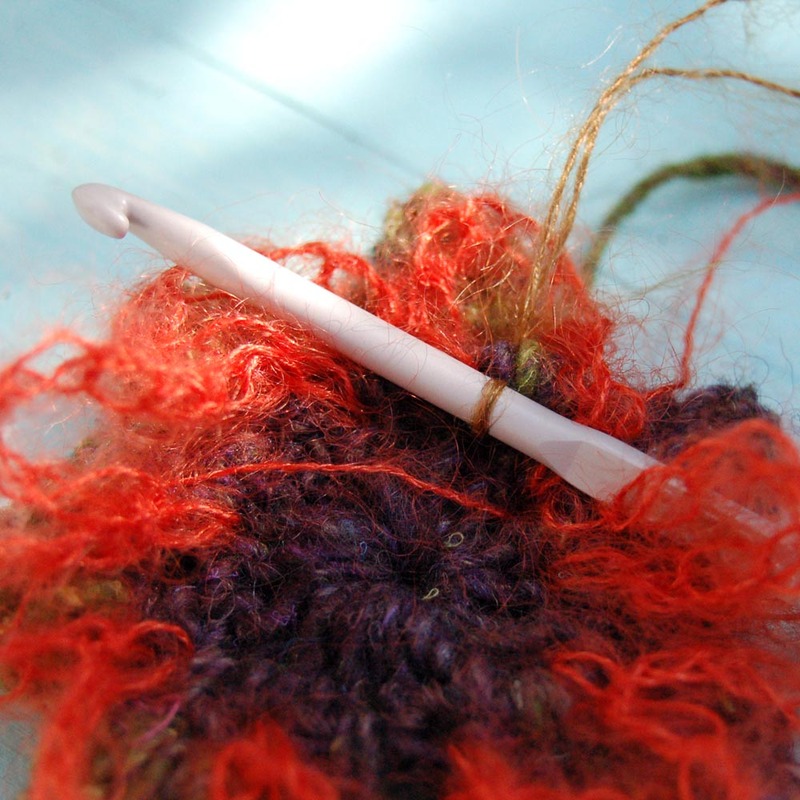 join yarn into the base of first stitch with a Slip Stitch. Next is making the petals. DC,TRC,DTRC,TRC,DC into each space /(3chain) joining with a SS at the base of each. Into first 3 CHain, *Double Crochet, Treble Crochet, Double Treble Crochet, Treble Crochet, Double Crochet, Join to the base of the next 3 CHain with a Slip Stitch* repeat until you have completed all the petals. Join with a Slip Stitch. Cut off yarn and pull it through the last stitch. Turn your flower over. Put your hook through the back of the stitch wrap orange yarn over hook, and pull back through making sure there is a long end. *CHain 8, Miss a space/stitch Slip Stitch into back of next Space* repeat all around. 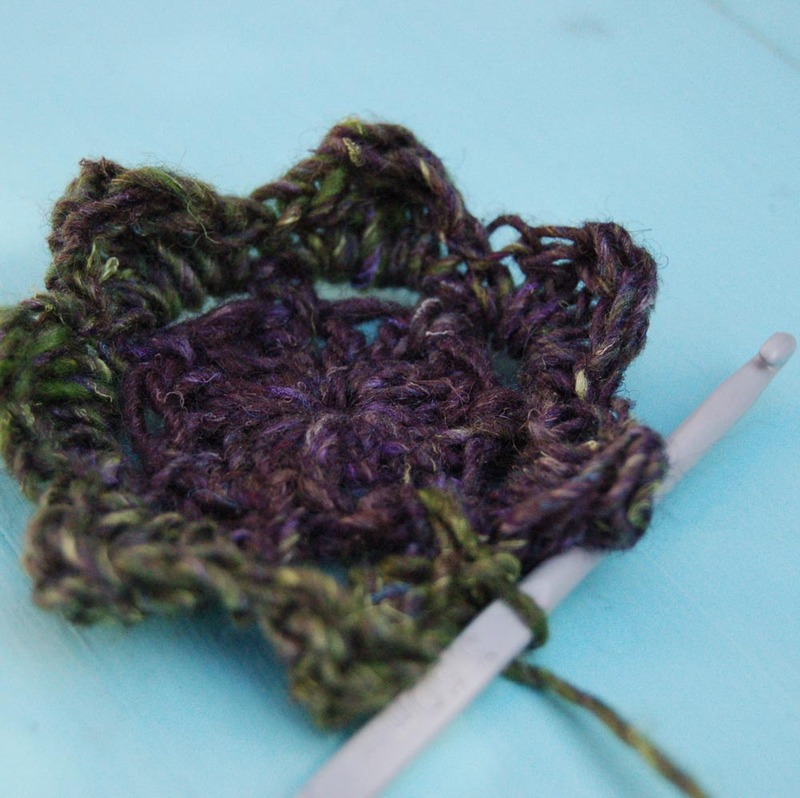 Join into first Stitch with a Slip Stitch. Cut Yarn and pull through stitch. Next insert the hook in the back of the stitch between the orange petals. YRH pull through Stitch. CHain 12 miss a stitch, Slip Stitch into back of the next Stitch (between the orange) CHain 12 repeat all the way around, Slip Stitch into last Stitch/Space cut yarn and pull it up through last stitch. Sew in the ends using a wool needle. I would turn the flower over so the front is facing and pull up the wool ends so that they are on the front of the flower, then sew them in (not visible from the back leaving it neat). 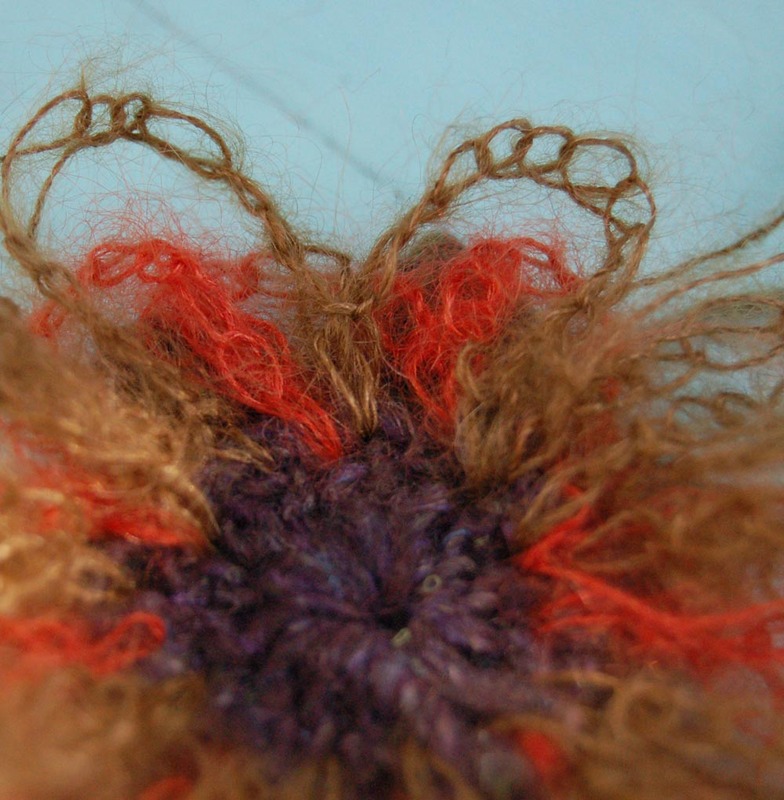 Then choose a large button use a sewing needle and cotton and stitch it into the center. I would secure the cotton first again on the front side of the flower (under the button) then sew the button on, sewing the cotton through to the back with the last stitch, turn the flower over and stitch on a brooch back. Secure cotton and cut off as close to the brooch back as possible. You should end up with a very neat finish. 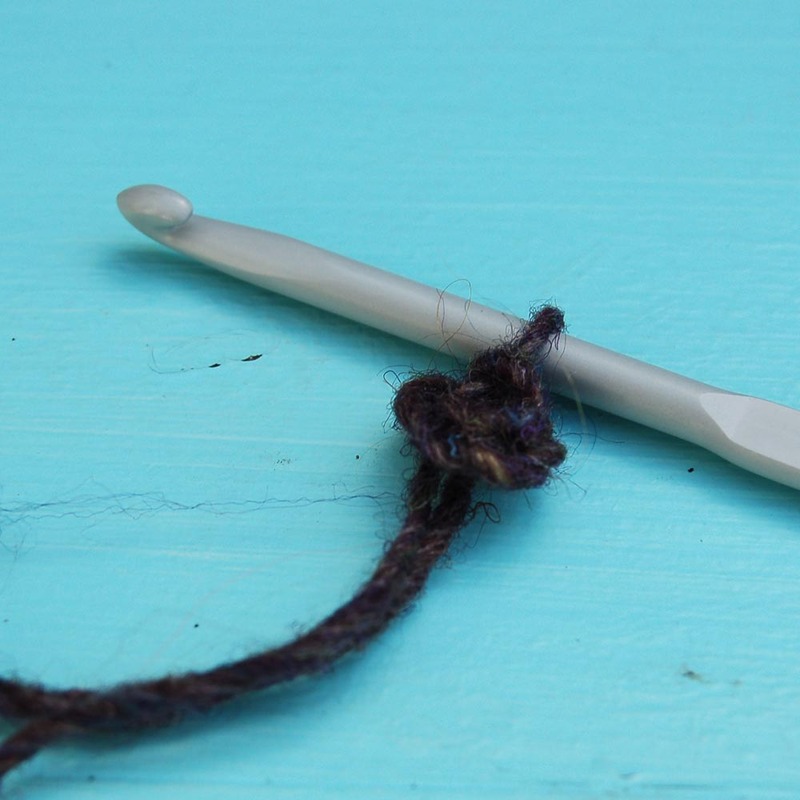 I hope this is helpful for crochet beginners. If I have written anything wrong or you have problems with the pattern do let me know 🙂 I would also love to see any flower brooches made using this pattern. Have fun. I am thinking of Spring and have gathered some gorgeous pastel shades of cotton together, to crochet flowers. I will then add floral vintage fabrics and buttons to the centre. I think there will be lots of pastel shades in the Spring collections, can’t wait to find out if I’m right.